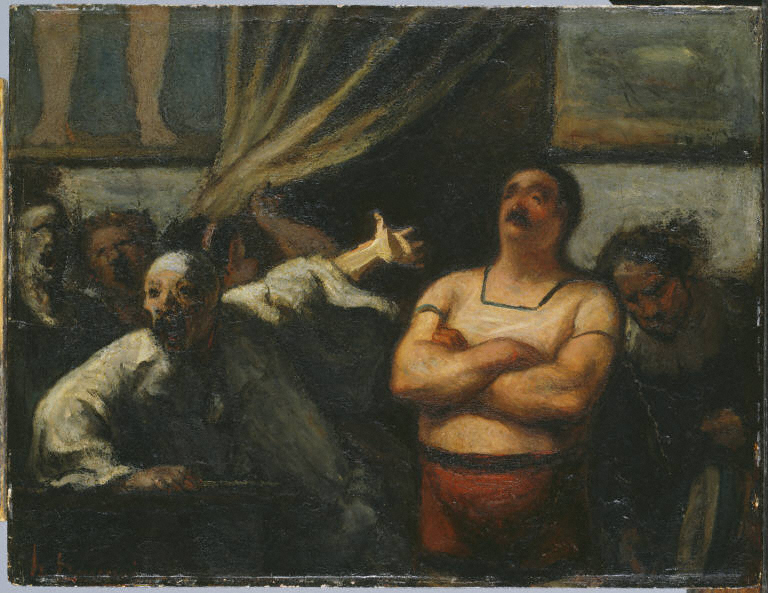 Honoré Daumier was born this day, 26 February, in 1808. Here is a look at a technical study undertaken by painting conservator Elizabeth Steele in 1999 of his small oil painting on a wooden panel, The Strongman, ca. 1865. 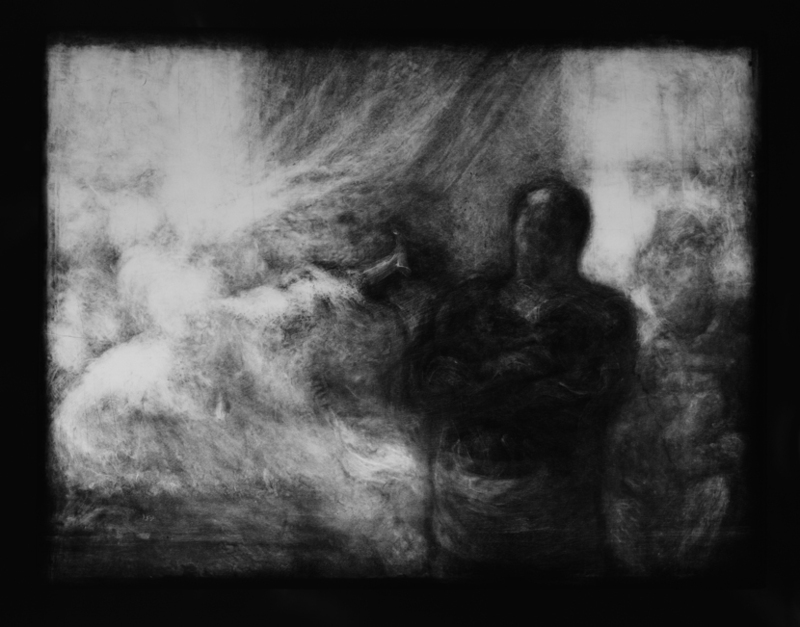 The x-radiograph of The Strongman attests to Daumier’s frequent custom of reworking a composition. A completely different figure wearing a striped jacket and a bicorne (two-cornered hat) lies beneath the man on the far right. In an earlier state, the curtain in the center of the painting was draped lower across the doorway. The bright white in the left half of the x-radiograph indicates the density of the paint in this area and reflects the number of times these passages were reworked. The heads of some of the figures in the background appear to have been shifted and the clown may have originally looked back towards the strongman instead of out at the viewer. By contrast, the dark torso of the strongman indicates little to no reworking of the painting’s main character. The painting’s strongly textured and deeply cracked surface reflects Daumier’s practice of painting one layer on top of the next without allowing for the underlying paint applications to fully dry. 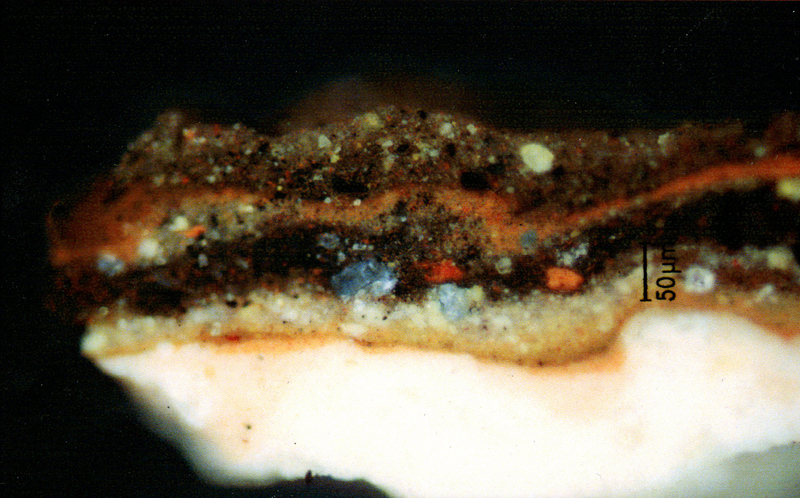 A microscopic paint cross-section taken from the upper left reveals no less than eight distinct layers in this heavily-reworked picture. The bottom layer is the white ground (1), followed by a thin red (2), a white (3), a dark brown (4), a thin light brown (5), a thicker red (6), another dark brown (7), and finally an ochre-colored layer at the top (8). In addition, beeswax was discovered in some passages. The beeswax may have served as an isolating layer between paint applications when changes to the composition were being made. This unorthodox technique of using a non-drying wax, a material readily available in Daumier’s studio for printmaking, may also account for the wrinkled appearance of the paint film. This entry was posted in Conservation Studio and tagged art conservation, conservators, layered painting, underpainting, x-ray. Bookmark the permalink.